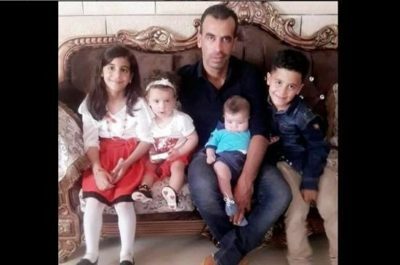 The Palestinian Health Ministry said the Palestinian, identified as Hamdi Taleb Sa’ada Na’san , 38, was shot with a live round in his back, and the bullet was logged in the upper abdomen. At approximately 15:30 on Saturday, 26 January 2019, a group of Israeli settlers moved into al-Moghayer village, northeast of Ramallah, and rioted on the streets while opening fire at several houses; 2 of them belonged to Jamal ‘Ali al-Na’asan and ‘Abdullah al-Na’asan, breaking all the houses’ windows. Meanwhile, dozens of Palestinian young men gathered to throw stones, empty bottles and Molotov Cocktails at them. In response, the settlers immediately and randomly fired a barrage of bullets, wounding Hamdi Taleb al-Na’asan (38) with a bullet that entered his lower back, hit the lungs and then exited from the chest. As a result, Hamdi fell on the ground and was immediately taken via an ambulance belonging to the Palestine Red Crescent Society (PRCS) to Palestine Medical Complex in Ramallah, where his death was declared in the ED due to arriving in a very critical condition. Following that, the Israeli forces moved into the village to provide protection for settlers and opened fire at the Palestinian protestors. As a result, 22 civilians were wounded with bullets and shrapnel; 8 of them were taken to the Palestine Medical Complex, 6 were taken to the Istishari Arab Hospital in al-Rihan Suburb, north of Ramallah, and 8 were taken to the medical center in nearby Termes’aya village. It should be mentioned that Hamdi al-Na’asan was a former prisoner in the Israeli jails, where he served an 8-year sentence. He was also married with 4 children; the youngest is only 1 year old. A lethal weekend for Palestinians — four killed, from Rafah in the Gaza Strip to Ramallah in the West Bank — ended Saturday with the death of a farmer in his olive orchard, in the central West Bank village of Al-Mughayyir. It was the afternoon. Hamdi Na’asan and a few fellow villagers were about to finish tilling their fine olive orchard, downhill from the virulent outpost of Adei Ad. It is plowing season and the farmers were turning over the earth on their beautifully terraced orchard. At around 4 P.M., a group of armed settlers approached from the direction of Adei Ad and began attacking them in an effort to chase them off their land. That is the routine here in the land of the outposts, especially in Al-Mughayyir. I was in the village last week, and I saw the still and bleeding remains of 25 olive trees planted 35 years ago, cut down by electric saws, tree after tree, on Friday January 11, three days before the Jewish holiday of Tu Bishvat, sometimes called Jewish Arbor Day. Footprints led to the Mevo Shiloh outpost, whose residents took over a half-abandoned army barracks on the hill above Al-Mughayyir’s fields. For the past two months, villagers had gathered every Friday at their land to demand the removal of Mevo Shiloh. Its settlers graze their flocks on the village’s land and have carried out so-called price tag attacks in the village, vandalizing cars. On Saturday they came from Adei Ad. A few days before, villagers said they had somehow learned to live with Adei Ad, and their problem was with Mevo Shilo. This weekend it became clear to them that it was a choice between plague and cholera. One week the evil came from the east, from Mevo Shilo, a week later from the north, Adei Ad — a rotation of hate crimes coming from the outposts. You should have seen the fear of the residents as we drove to their orchards last week as we approached Mevo Shilo, to see the atmosphere of threats and terror with which they live. After the settlers came down and attacked them, the farmers phoned for help. They were utterly helpless: The army will always side with the settlers, of course. The residents also called the Palestinian liaison bureau but didn’t get any help. Military forces arrived, and soldiers and settlers began shooting live ammunition toward the farmers. Villagers deny claims that the settlers were attacked by farmers. Anyone familiar with the Shiloh Valley knows how difficult, impossible really, it is to believe such claims. The settlers descend upon fields that aren’t theirs for the sole purpose of evicting residents from their land and striking fear. That’s the aim, that’s the goal. The farmers and villagers who rushed to help them fled south, toward the village, as soldiers and settlers fired first tear gas, that enveloped the homes, and then live ammunition. They shot at them as they fled. Na’asan was shot in the back. The Israel Defense Forces said Saturday night that he was shot by a settler. It took an hour to bring him to the government hospital in Ramallah. An additional 15 villagers were wounded. Nine were admitted to the Ramallah hospital; three needed surgery. The view from Al-Mughayyir is gorgeous this time of year, a fertile valley, cultivated amazingly. Brown earth sprouting blossoming olive orchards and green fields. And here are the photographs of Na’asan’s death: His dead face and closed eyes, the small hole in his back, near his spine. He was 38, a father of four, a relative of Abed al Hai Na’asan, the owner of the orchard whose trees were cut down, with whom we went last week to witness the damage and his pain. Thus fell the village’s first victim since the start of its popular protest, and he will probably not be the last. BETHLEHEM (Ma’an) — The United Nations Special Coordinator for the Middle East Peace Process, Nikolay Mladenov, condemned in a tweet the Israeli settlers’ killing of a Palestinian father during an attack on al-Mughayyir village, on Saturday. “My thoughts and prayers go out to the family of the #Palestinian man killed and those injured… All must condemn violence, stand up to terror,” he stressed. Nikolay Mladenov, l’envoyé des Nations Unies au Moyen-Orient, appelle Israël à traduire en justice les assassins du Palestinien Hamdi Naasan. L’envoyé de l’ONU au Moyen-Orient a qualifié le meurtre d’un Palestinien par les colons israéliens en Cisjordanie occupée de « choquant et inacceptable ». Nikolay Mladenov a appelé dimanche Israël à « mettre fin à la violence des colons et à traduire les responsables en justice ». Hamdi Naasan, âgé de 38 ans, a succombé à ses blessures samedi près du village d’Al Mugheir après que des colons israéliens de la colonie illégale d’Adei Ad, située à proximité, aient tiré des coups de feu. Selon le ministère palestinien de la Santé, Naasan aurait reçu une balle de fusil dans le dos. Selon l’agence de presse Maan, au moins 30 autres Palestiniens ont été blessés, dont six par des tirs à balles réelles. 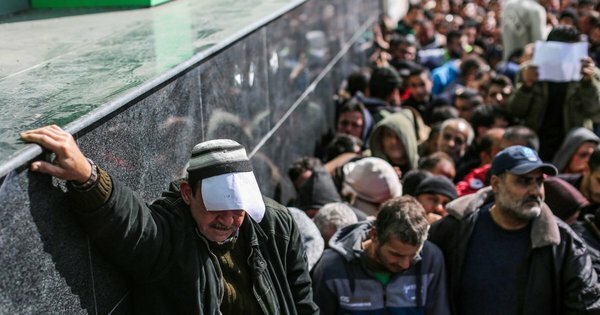 Des milliers de personnes se sont rassemblées dans le village d’al-Mugheir pour assister aux funérailles de Naasan. L’armée israélienne a temporairement empêché les personnes en deuil d’atteindre le lieu de sépulture en érigeant un barrage routier entre l’autoroute et une route menant au village. Lors d’un affrontement qui a suivi, l’armée israélienne a kidnappé deux adolescents palestiniens.